Exhilarating and affordable prom limo bus rental in Toronto and the GTA. When you are looking for the perfect prom bus rentals, then we have the perfect answer for you. Our fleet is one of the largest and most exciting in all of Southern Ontario. Furthermore, our services are top-notch, and we have a professional team of chauffeurs and drivers who can help you travel safely to your graduation party along with your friends. If you're looking for a great deal on limos for prom, then we can help. We have a fantastic selection of prom limo packages that are priced just right. In fact, our prom party bus prices may surprise you! You are bound to get great deals because we have very high volume so that we can provide you with the bus rental at excellent rates. If you are traveling with a large group of your friends, then the cost can even be less because you'll be sharing the ride with up to forty of your friends! Yes, we have prom busses that can carry as many as forty-five passengers. That's a lot of fun! We deliver excellent prom limo prices while ensuring that you get the highest quality service at the same time! In addition to making the night fun and exciting for the kids, we also deliver a safe and secure method of transport that the parents will surely appreciate. Our rental bus comes with a dedicated chauffeur who is responsible for the safety and well-being of the graduating students during their travel time. The driver will ensure that the kids get to their destination and return safely. Furthermore, having a chauffeur will make sure that no one will drink and drive, something that can be dangerous for a bunch of teenagers celebrating their graduation. Our fleet includes a large number of vehicles for you to choose. 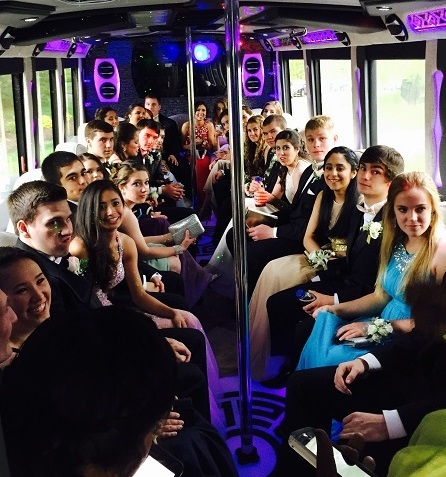 You can select a party bus for prom, or perhaps you prefer to use a traditional limousine. We have a wide variety of prom rentals which includes limos, stretch limousines, Hummer limo and party buses. We even have a limo bus with bathroom for those large groups of teenagers traveling together. Many of our Toronto prom limousine bus rentals have dance floors with luxury hardwood flooring. The limousine bus also comes with advanced gadgets such as home theater surround sound with mp3 connectivity, so you can listen to your favorite tunes while on your way to the party. We make getting great buses for prom easy! By using our services, you can be sure that you are getting the party limo bus that is perfect for your needs. We have an outstanding team of professionals who have delivered prom bus services time and time again. So if you're seeking the most elegant prom transportation, then call us today. We have some of the most outstanding prices for party buses, and we guarantee our work. Don't settle for any prom bus hire, call us first and get the bus party that you have always wanted! We are delighted to provide you with our services including our customer satisfaction guarantee! We will do all that is possible to ensure that you are satisfied with transport hire for prom. If you are not happy for any reason, we will work hard to make it right. Call us today for a free quote!